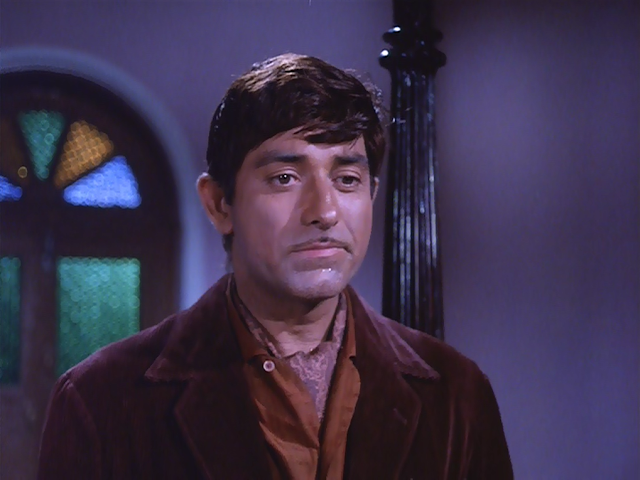 Welcome to the final installment of Raaj Kumar Week . . . 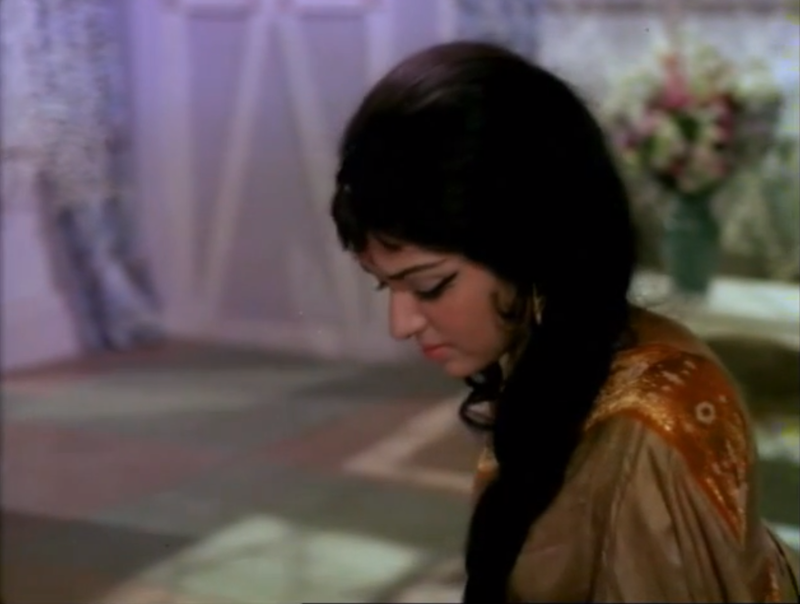 Mere Huzoor (1968). Yes. I am also sad to see your week end so soon. If all I did was look at screen caps from this film for the next week, I think I would be ready to marry the art director of this film and have his children. 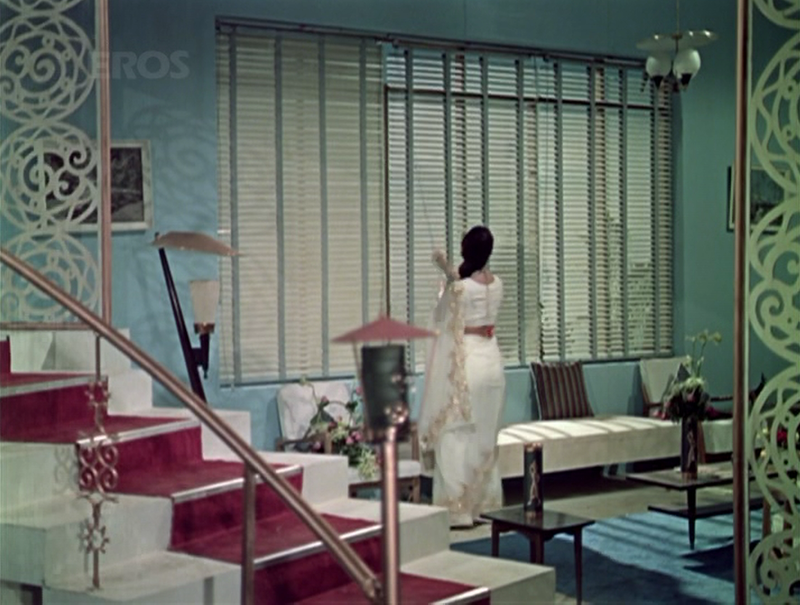 The sets, the costumes, the lighting (good lighting is one of the joys of my existence, both inside and outside films). And speaking of lighting, the variety of antique colored-glass chandeliers alone (one of my favorite pieces of decor in classic Indian films) might have been enough to keep me hooked. Why always . . .
. . . the upper . . .
. . . left corner? I wish I knew. Unfortunately, the film is far more satisfying visually than emotionally, despite its fairly strong cast and intriguing story. 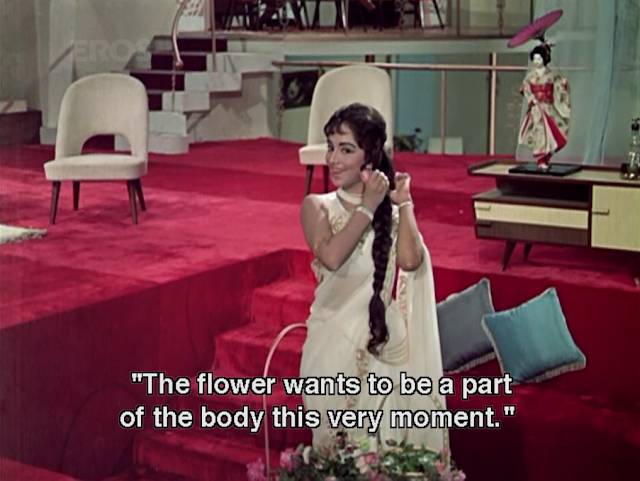 Yes, Mala Sinha. 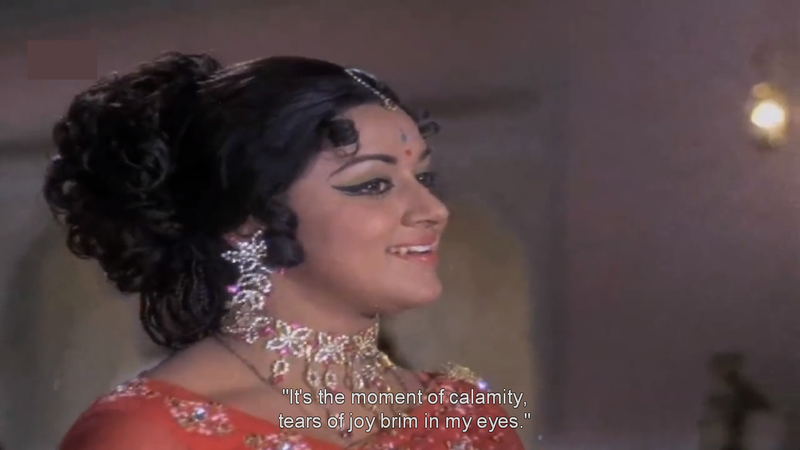 This is also exactly how I looked after finishing this film. Wait, you want a plot summary? You are welcome to go here, and here for a longer, more detailed discussion and breakdown of the plot elements. 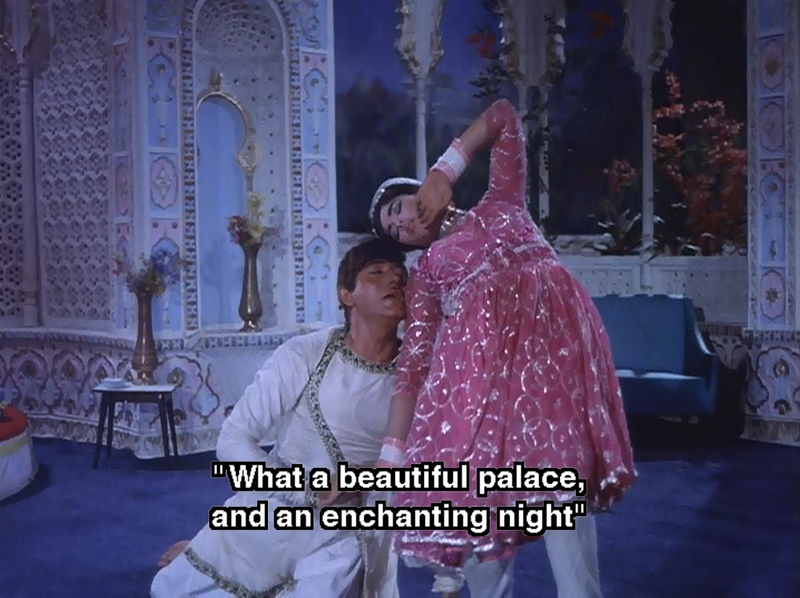 But for now, all you really need to know is that once upon a time, in the temptation-filled courtyards of Lucknow, a misunderstood Nawab (Raaj Kumar) and a feckless Urdu poet (Jeetendra), vied for the affection of the same upright (yet feisty) Muslim woman (Mala Sinha), little knowing how how miserable they were all about to be. This film may not have been very satisfying in it's ultimate conclusion (*spoiler* it goes the way of a morality play, when it could have been so much more), yet I did find the journey strangely satisfying. Whereas I often feel I know where a story is going . . . I really didn't know this time . . . and I was consistently intrigued by the character's choices and reactions. 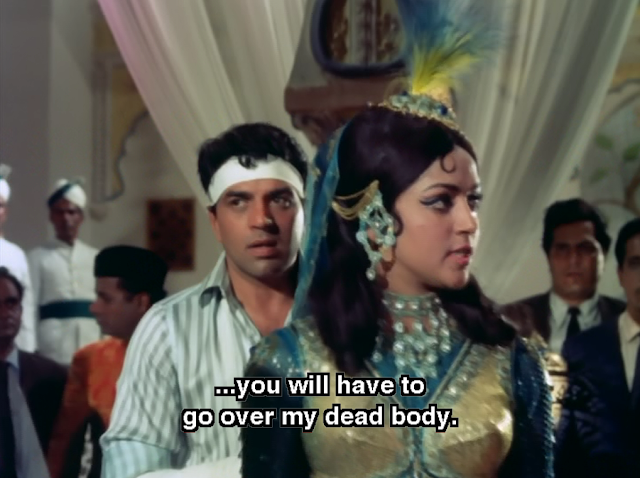 That's exactly what I have decided to do with you, Mere Huzoor. Embrace your madness. The eye candy . . . (The costumes alone) . . .
We are feisty females, and have very little trouble overwhelming the men in our lives. Until our lives overwhelm us. The indulgent melodrama . . . The visual catharsis . . . The eye candy . . .
And on and on and on forever. If you embrace the madness, you might even find yourself enjoying the ride. The film was more haunting than it should been, given its flaws, and I think I will require some more processing time . . . and potentially unorthadox processing tools. 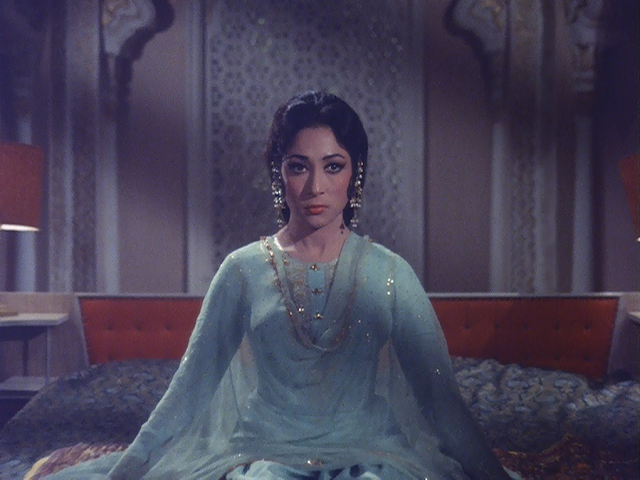 For example, I usually feel that following action (upon which YouTube is practically built) to be next-to cinematic blasphemy--but somehow I found myself watching the film again, this time muted, using this haunting Sufi-poetry-inspired number (by Afghan singer, Sediq Shubab) as the background music (you can try it it if you like . . . starting the film somewhere around 2:38:53). Even some of the camera angles . . .
. . . seem to be telling a similar story. 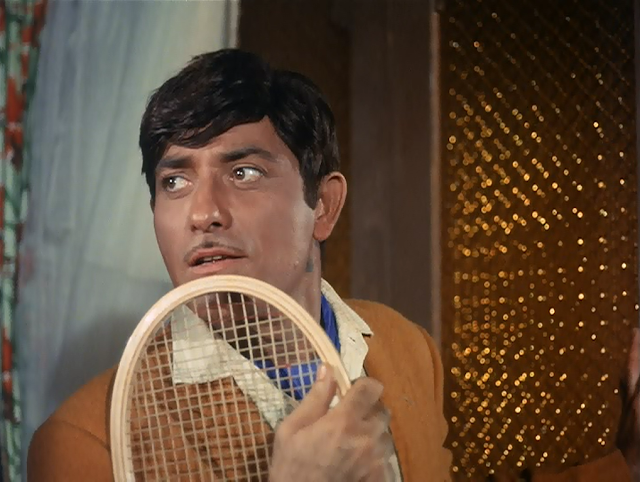 As for Raaj Kumar. . . I don't know how much I would have cared about the story if it hadn't been for his character. 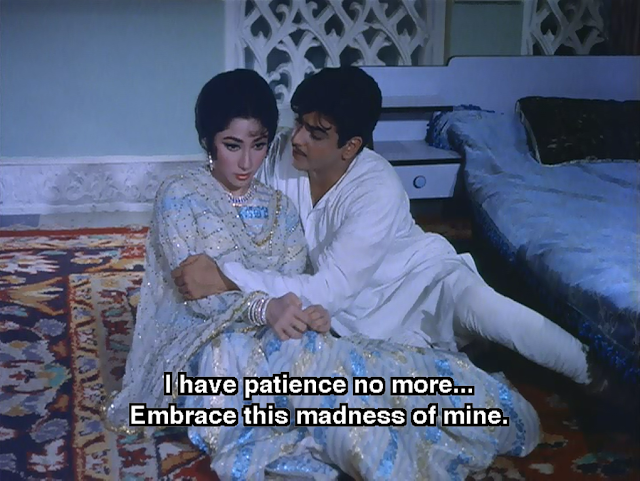 Jeetendra gives a decent performance (although he is far better at the early flirtation than the later weepy drama), and Mala Sinha warmed my inner drama geek's heart with her old-school emotive style (full-steam-ahead-wide-eyed-throw-oneself-upon-the-furniture-at-the-least-sign-of-trouble style) . . . but if it had just been the chronicle of their characters' courtship and subsequent marital troubles, I would have never gotten through the story. 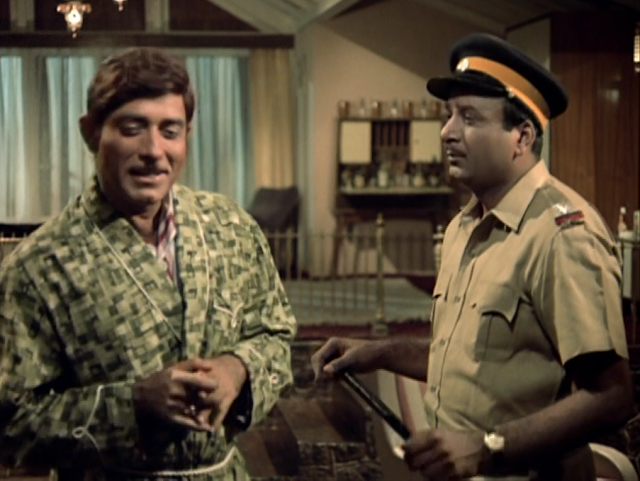 His character has some interesting motivations, but Raaj gives the Nawab a lot more oomph and layers (in my subjective opinion at least) than seemed to exist in the script alone. As usual he is not very believable when he "sings" (I haven't seen it in his films much, and when I see it, I realize why). 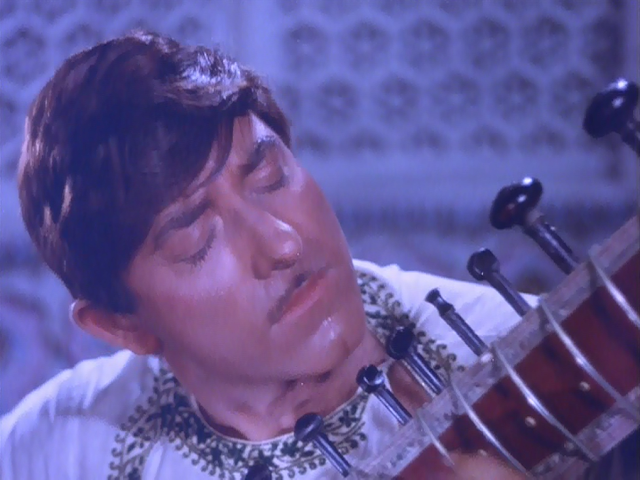 However, for whatever reason, his fake instrument playing is surprisingly convincing compared to a lot of what I've seen in Hindi films. 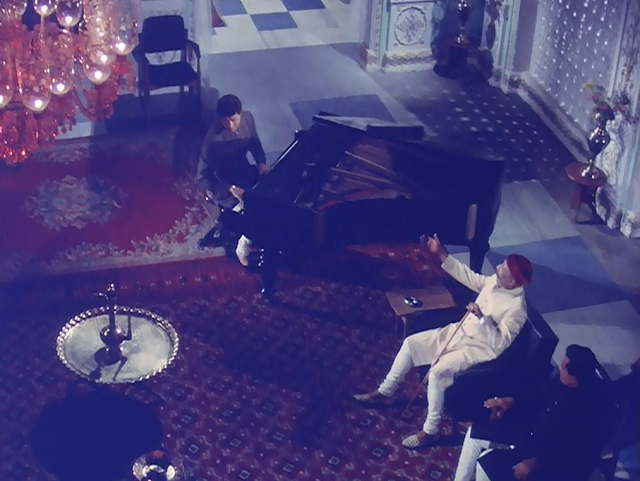 It makes me wonder if he actually dabbled in the piano, sitar, etc. But still . 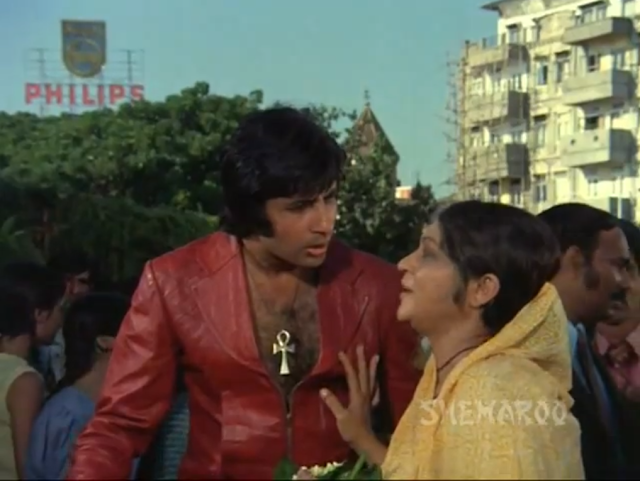 . . he adds so much more to this role by letting us see into the reasoning behind the Nawab's choices. . . which are kind of complex when isolated and deconstructed. Rather than giving off a fatalistic, self-destructive Devdas-vibe (which could have been all too easy), he portrays a complicated man caught between disparate loyalties and loves . . . who indulges in small passions, while completely forgoing the great ones. Which is why, when his character's choices grow more extreme towards the end, we can forgive him, because we have seen his moral arc, and understand it . . . even if we don't particularly agree with it. Thanks for a lovely week (and a half) Raaj Kumar-ji . 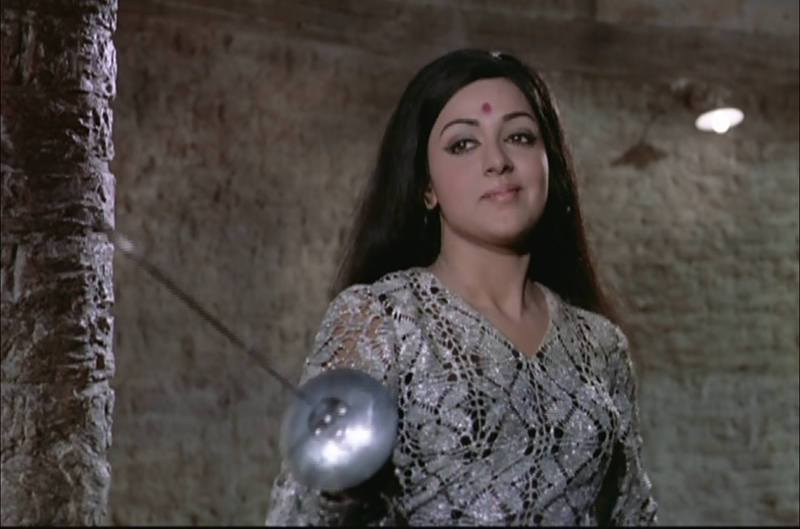 . .
An Ode to Hema . . . I'm taking a short break from Raaj Kumar Week (and a half) here at Filmi~Contrast, and taking a moment to acknowledge my favorite filmi-actress on her 65th birthday. Don't mention your birthday, you say? Well, I shall. Try and stop me. 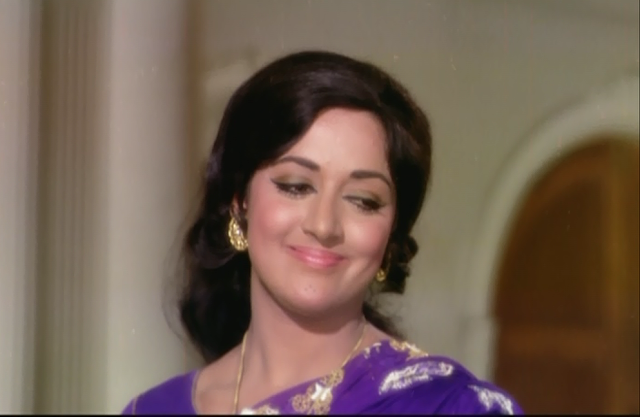 I'm pretty sure every week is going to be Hema Malini week here for a while (yes, I'm obsessed), so I won't worry about dedicating a post series just to her films. That might turn out to be rather superfluous, given my watching choices recently. For now, I'll just count down the newly discovered things that make me adore Hema on my journey so far . . .
5. 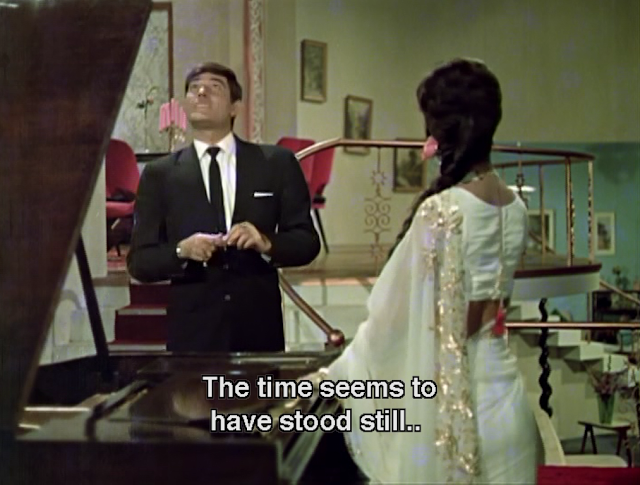 Her oh-so-lovely chemistry/deeply palpable on-screen understanding with Dharmendra. I mean really, how could I not mention this? I can't speak to their personal life, but their onscreen life is the epitome of what I want to see between male/female romantic leads. Even when she wasn't playing his on-screen love-interest, they made perfect sense as friends and partners in crime. Sure she could handle herself in the dishoom dishoom department, and knew what to do with a whip. But you really don't want to get on her bad side in any way, shape, or form . . . considering that she could also slay you with a look. My name is Geeta. You stole my sister . . . prepare to die. 3. 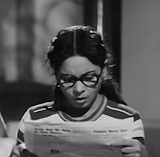 Her ability to convey bitter ironies with merely a look, a turn of the wrist, or a wry smile. 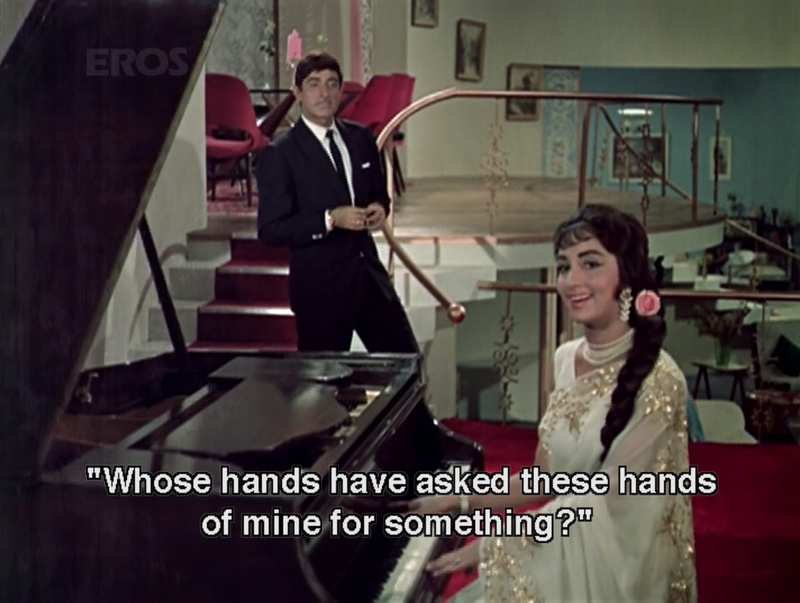 I can't think of a more powerful example than this song, Mubarak Ho Tujhe Ae Dil (Raja Jani, 1972), in which she congratulates Dharmendra's character on getting everything he wanted . . . while making her life a misterable lie in the process. One of her many excellent uses of the "kindness as a rebuke" strategy. 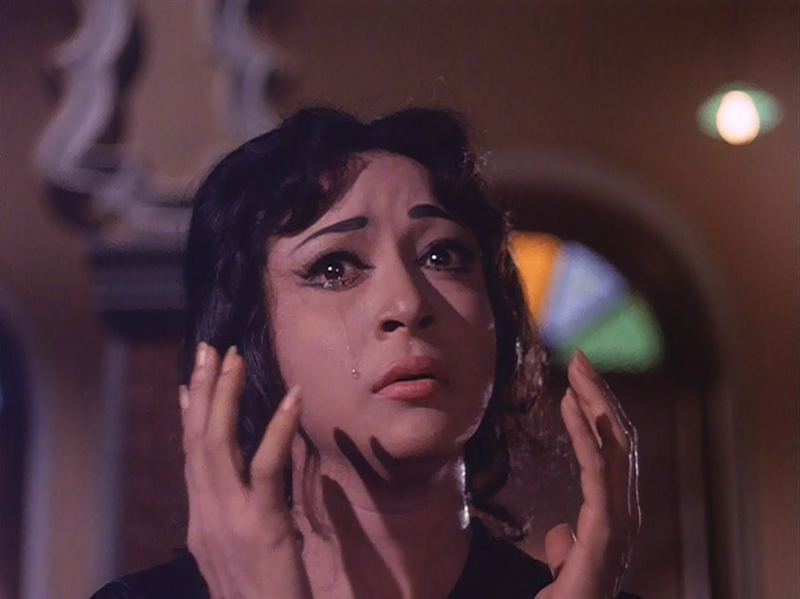 These kind of facial acrobatics seem to be par for the course in Hema roles, especially in masala films. 1. Her ability to project the strength of her own self-awareness even on the most oppressed, downtrodden characters. 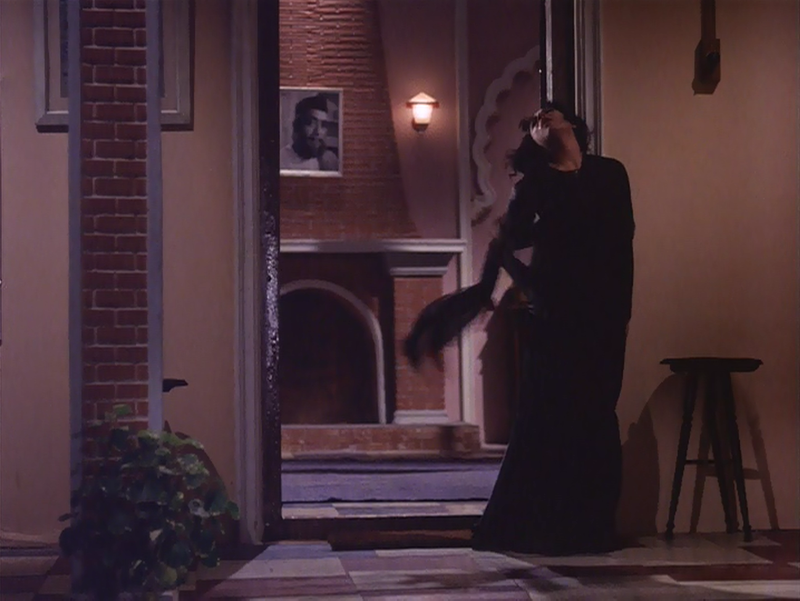 Even in her suffering female roles . . . I still see the strong woman underneath . . . the woman who is confident in her own identity, no matter who else takes issue with it. She looks sad, but the beauty of it is, you knows she's about to get it done. 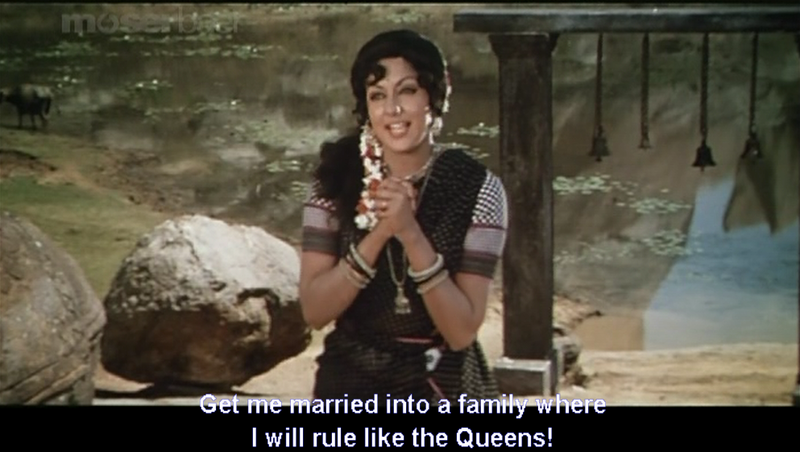 Whether she is faced with societal sexism or goondas galore or even (horrors!) bad writing, I always feel that her characters will never give up. I'd like to think that is perhaps a reflection of who she is. 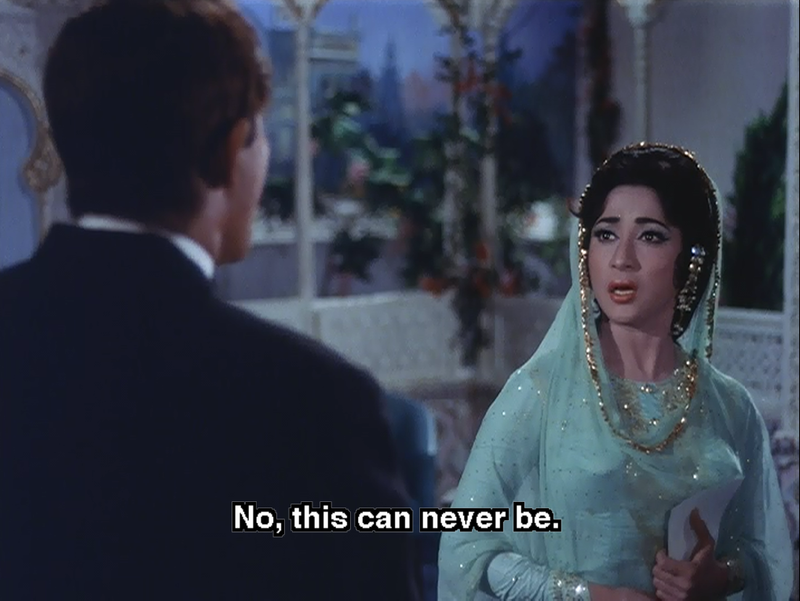 (If it's not, she's TRULY the greatest actress ever.) Gosh, I love her, but I'm going to end it here, instead of going on and on and on and on for the rest of the night. I don't know if she'd like all this fuss, anyhow. 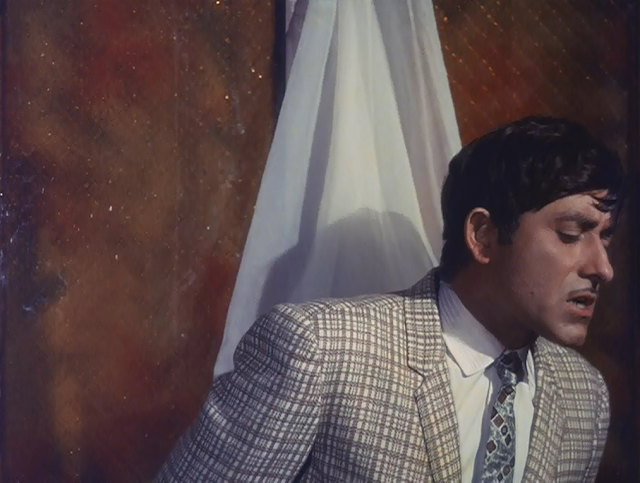 Raaj Kumar Week continues at Filmi~Contrast . . .
. . . and might continue throughout the next as I have another Raaj film coming in the mail and it would be a shame if I wasted the opportunity. 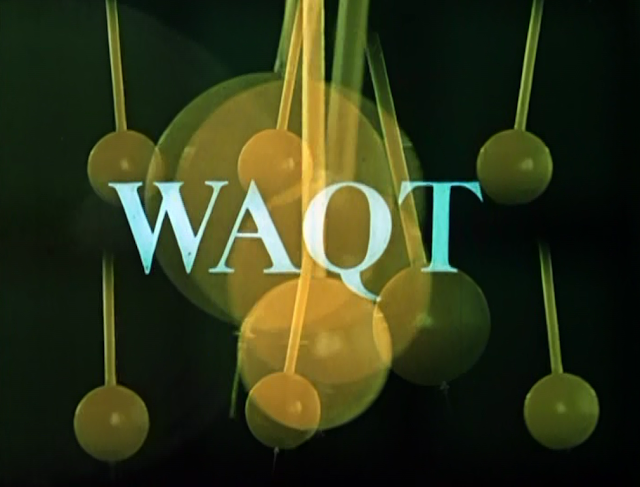 Waqt (1965). What can I say about you without feeling a little guilty? I thought that my masala-loving heart would be suitably warmed by your presence, and yet, I was left a bit cold. 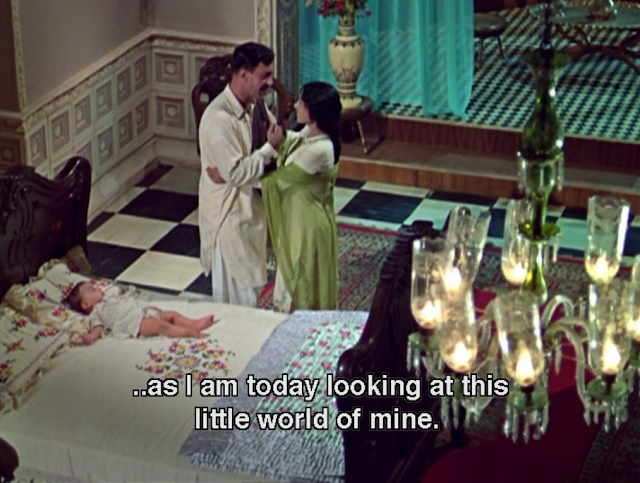 At the end of the day, despite it's good points, good cast, and early masala flavor (catastrophe separates mother, father, three sons . . . until circumstances throw the family back together 20 odd years later), I just didn't love this film. I wanted to, I really thought I would, but somehow, I just didn't. 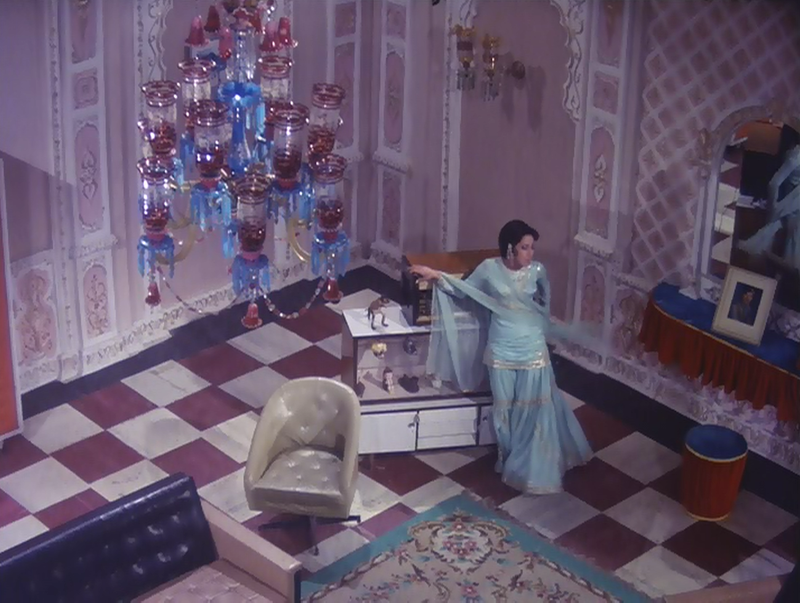 (A) It's got lovely 60's mod-style (one can always count on Yash Chopra's production team to deliver sumptuous, trendy, and so-good-they're-almost-edible sets and costumes). 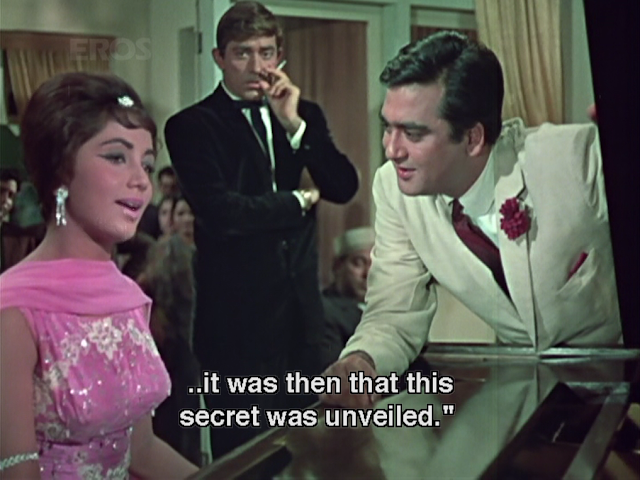 (B) It's got Shashi being wooed by a refreshingly modern Sharmila. Sharmila teaching Shashi how to drive a stick. For reals. I really want this view, the sarcastic Shashi of this scene, and whatever autumn-toned garments Sharmila is wearing. (C) It's got three pretty memorable songs/picturizations. 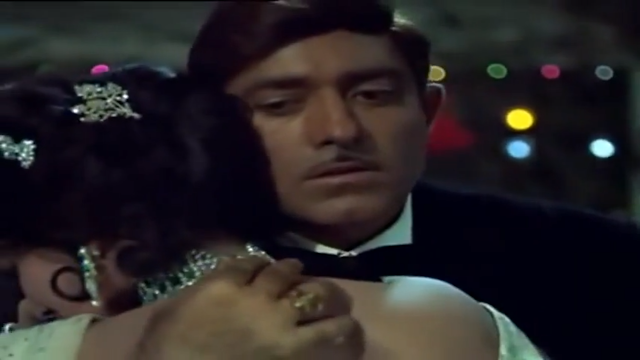 *Din Hai Bahaar Ke (Mahender Kapoor and Asha Bhosle): an adorable boat song with Shashi. What more do you need to know? 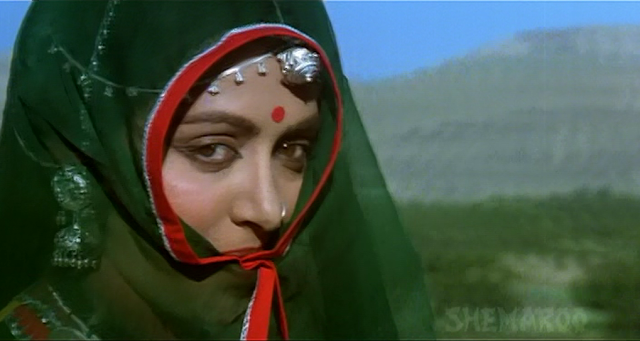 (D) It's directed by Yash Chopra, and he REALLY knew what he was doing back in the 60's and 70's. 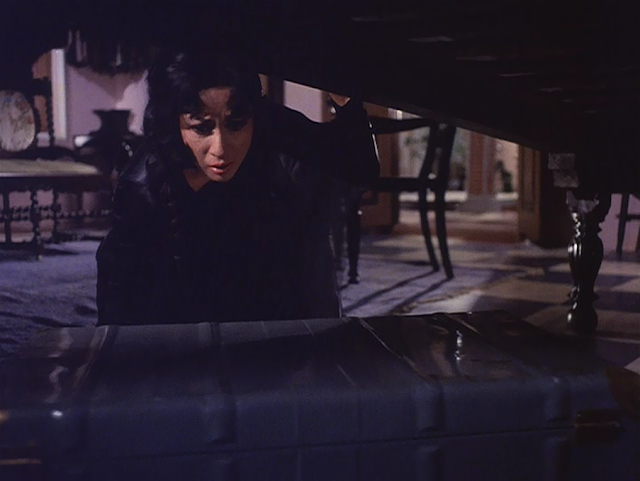 This scene, right before the catastrophe, is brilliant in so many ways. I'll never look at a chandelier the same way again. 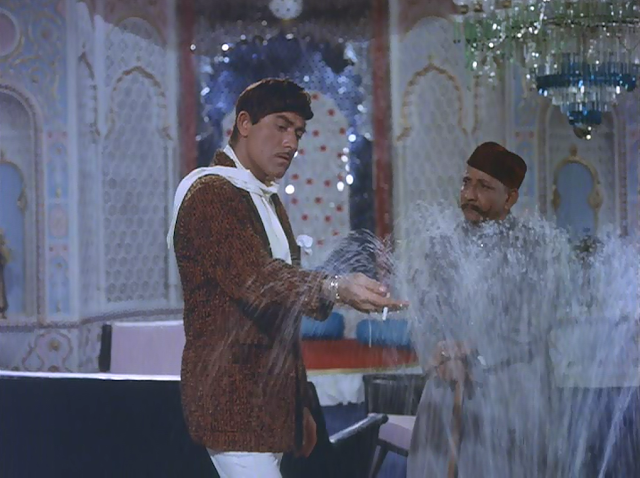 (E) Because of the screencaps I saw elsewhere of THIS scene with Raaj Kumar. I know I've posted this shot before, but I don't care. It's the scene that pulled me into watching the film in the first place. And you have to congratulate a film that can do that with one, unforgettable moment alone. 1. The pacing, the pacing, the pacing: alternating between manic and lazy. 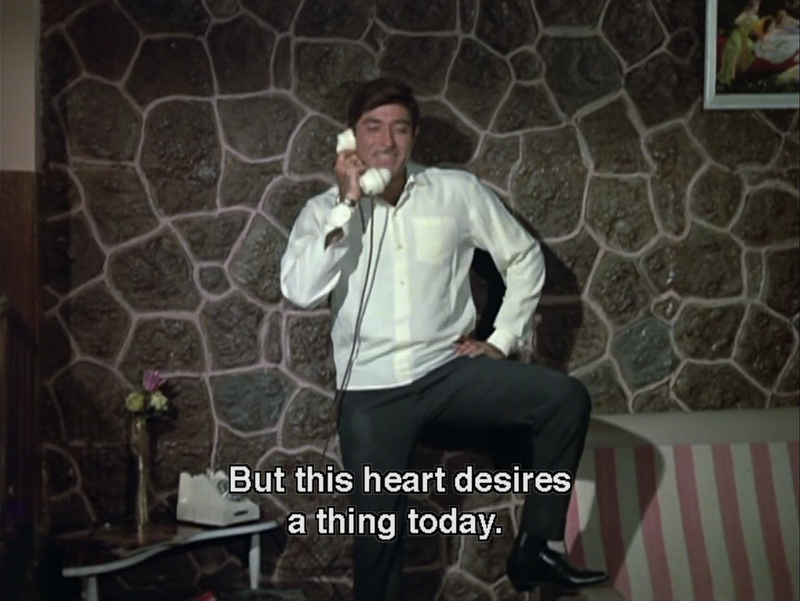 It reminded me of Kabhi Kabhie that way. Strong beginning, decent ending, but a confused middle that doesn't give you enough landmarks to let you know where you are in the story. (Wait, what's going on? Why are we seeing this scene? Why do we care?) 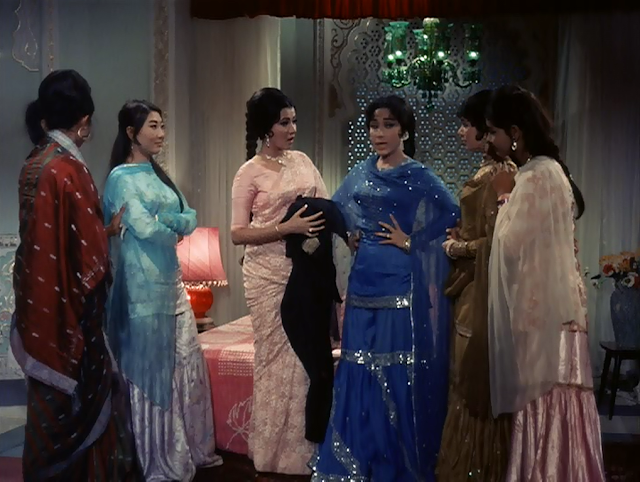 Despite some spectacular sequences, if I hadn't conned my brother into watching some of this with me, I probably would STILL be stuck somewhere in the middle. 2. 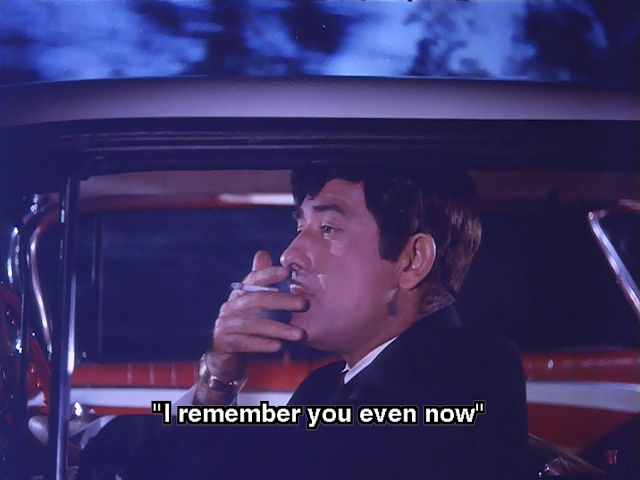 Sunil Dutt and Sadhana's characters, mostly. They did improve a bit in the last 30 mins, but still. Grrr. I get it! They're young! They're foolish! They don't care about anyone except themselves until things get serious! I guess that's realistic for their on-screen age, but when they didn't care about anyone except each other (thoughtlessness and discourtesy from so called "nice characters" really irritates me) and still managed to hog so much screen-time (they WERE billed first, so I should have known), I found it hard to care about them. 3. 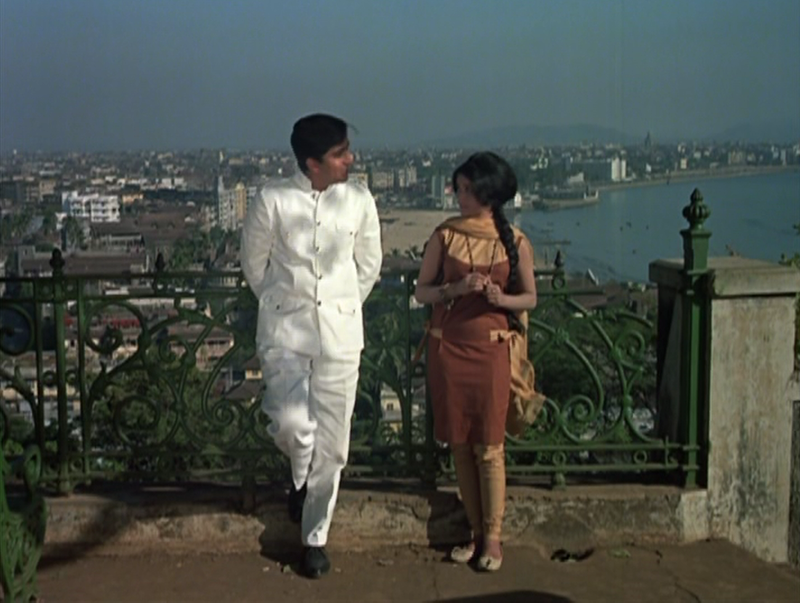 For a masala film, I felt too removed from the characters's struggles and related feelings-thereof. 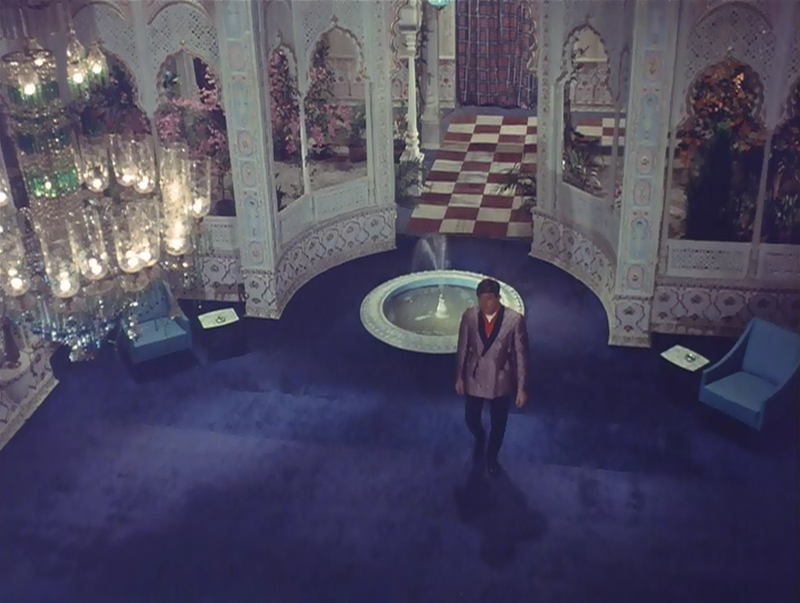 Perhaps because of the number of leads (it reminded me of Desai's AAA) the story was told in too much of a third-person perspective. Maybe the film just lacked in close-up cinematography, or the screenwriting didn't set up the personalities in ways that made me care about them, but I know I should have felt the masala knife-to-the-heart more often, considering the heart-string-jerking plot summary alone. It certainly wasn't a problem with the cast--who by and large, did wonderful things with the material and time they were given. Amitabh, I'm your favorite on-screen Maa, so be honest. Do you think your character ate up screen-time and kept Amar and Akbar from ever getting proper three-dimensional arcs? 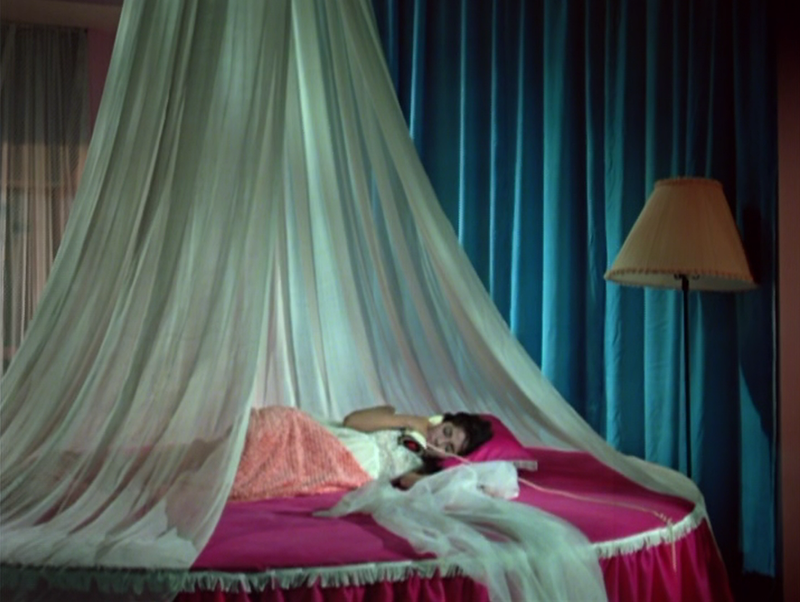 I admit I have yet to fall into a good rhythm with 60's films. I'm nearing 50 films-watched from the 70's and simultaneously feel I am edging towards fluency in the decade's story-telling style. It is possible that once I've seen a couple dozen from the 60's, I will be more attuned to the language of the cinema back then . . . the particular blend of storytelling ingredients that one sometimes needs to acquire a taste for. . . and maybe then, I will return to Waqt and it will speak to me. If you want more on the film by people more enthusiastic and expert-y than I, well then. 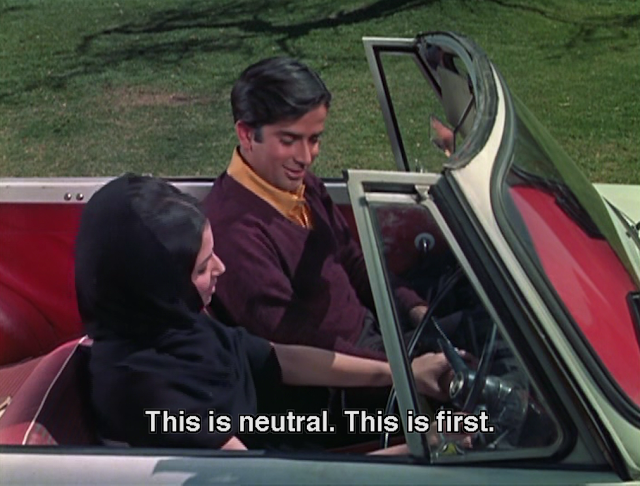 . . for another fashion flavored, Shashi-centric and masala-focused review, go here. And for an extensive review and discussion of the plot, go here. So on to the saving grace of the film (for me at least), my blog's resident fascination, Raaj Kumar. 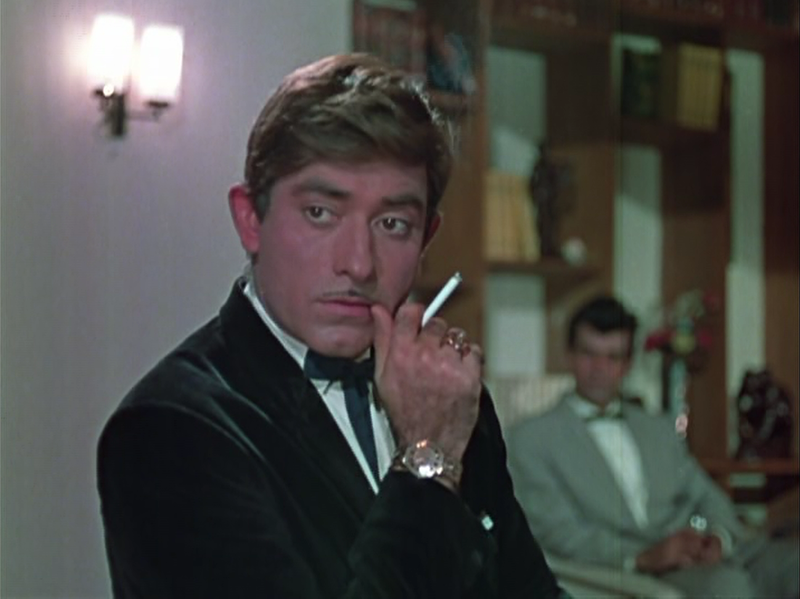 To be fair, Raaj Kumar really does get the most interesting character (on paper) in the film. He's the oldest child, so he has the most significant childhood storyline (one that shows his general resourcefulness and self-respect). Then he grows up to be both a thief AND (we think) a good person. 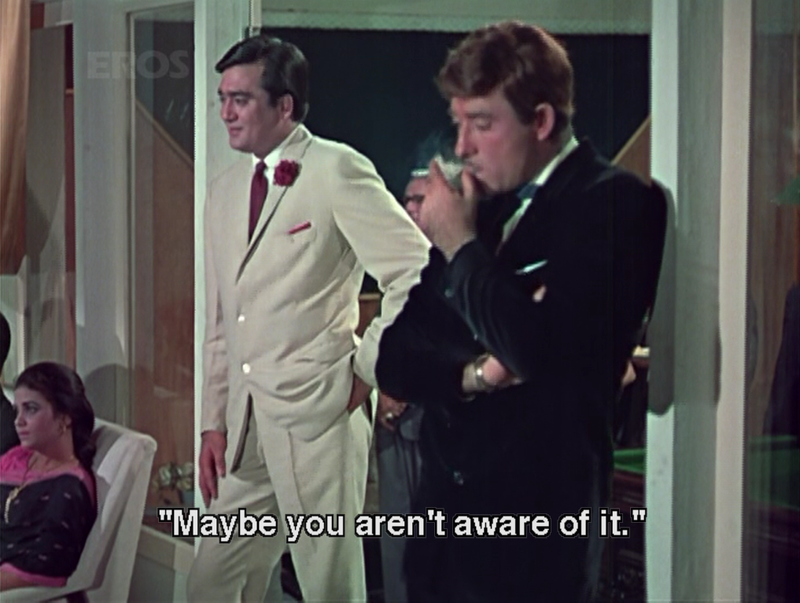 So, he gets to be naughty, and you still empathize with him. Yay for gray areas! My brother saw this and shouted, "This just never happens in Hollywood. One guy sneaking into another guy's bedroom? It just doesn't happen! 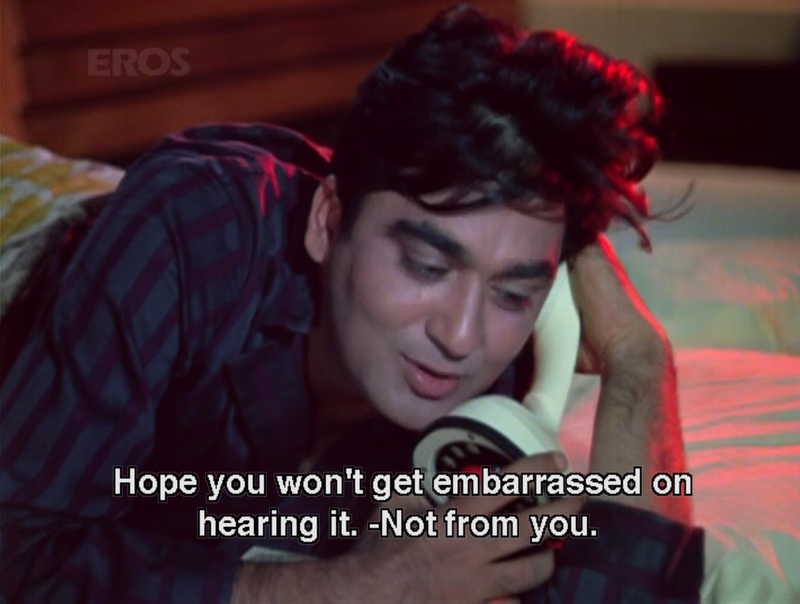 But Bollywood doesn't think twice." His character is smart and pretty darn self-assured . . . UNTIL he meets Sadhana, and loses his brain for a while, who knows why. Realistic tho, for self-proclaimed *ahem* brainy types. You want to know how I know? Uhh, no comment. 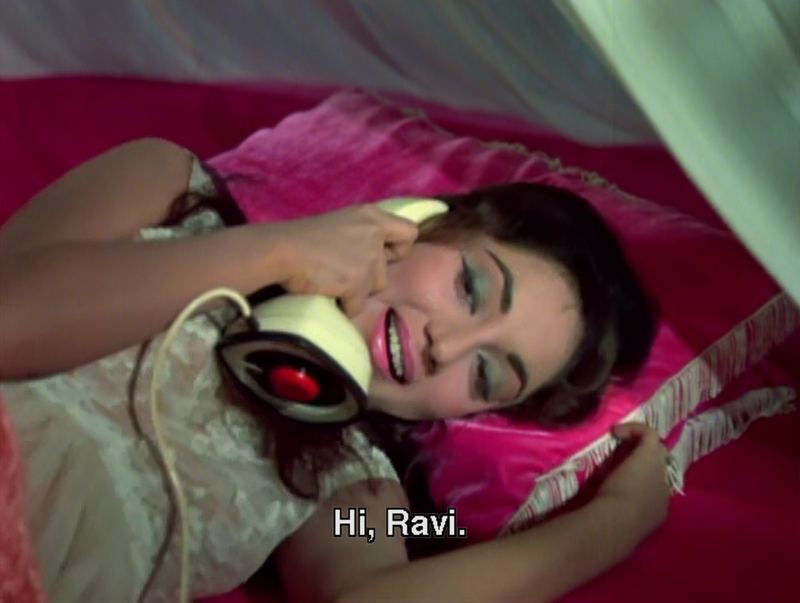 No, Raaj honey, she's singing about your younger brother. Don't get too excited. 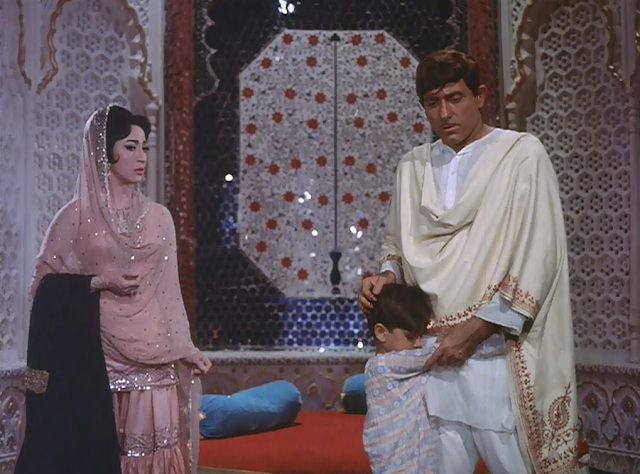 Raaj's character did seem to be the only son out of the separated three that inherited their father's poetic inclinations. 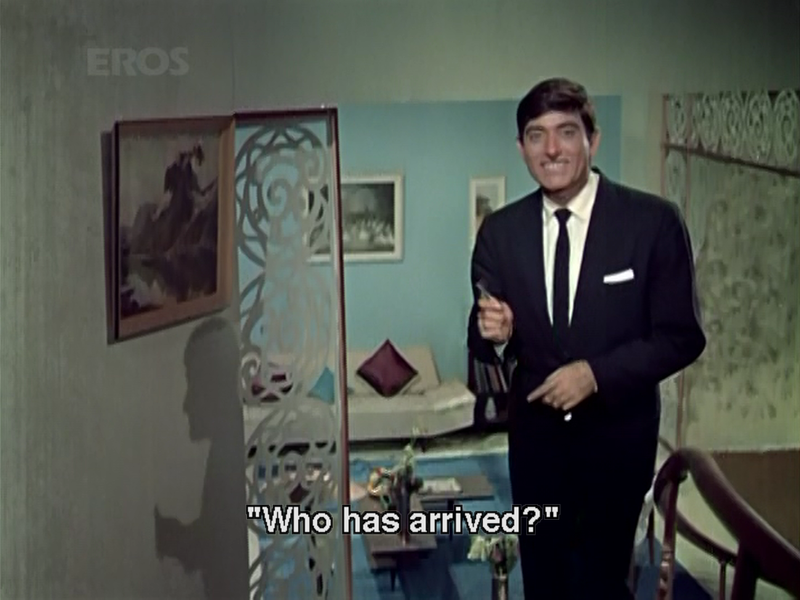 This role gives Raaj Kumar the chance to do what he does best . . . brooding, gravely sarcasm, potential for violence despite a veil of gentlemanly etiquette . . . all while projecting the general sense that he's smarter and more aware (and more cynical about the world) than everyone else around him. 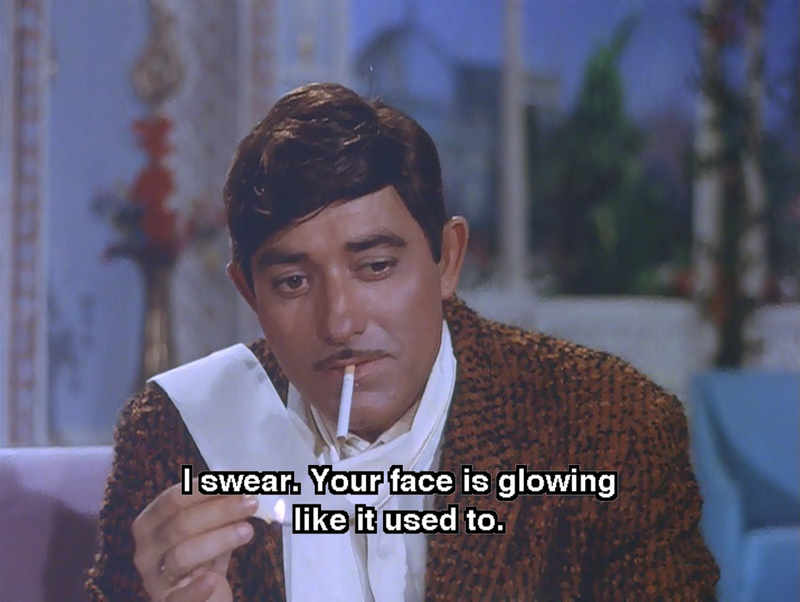 I thoroughly enjoyed him in this film. Overall, now that I know what I'm in for, and can suitably look forward to the right ups and downs of the plot, I think Waqt may be better upon re-watching than it was in the initial experience. 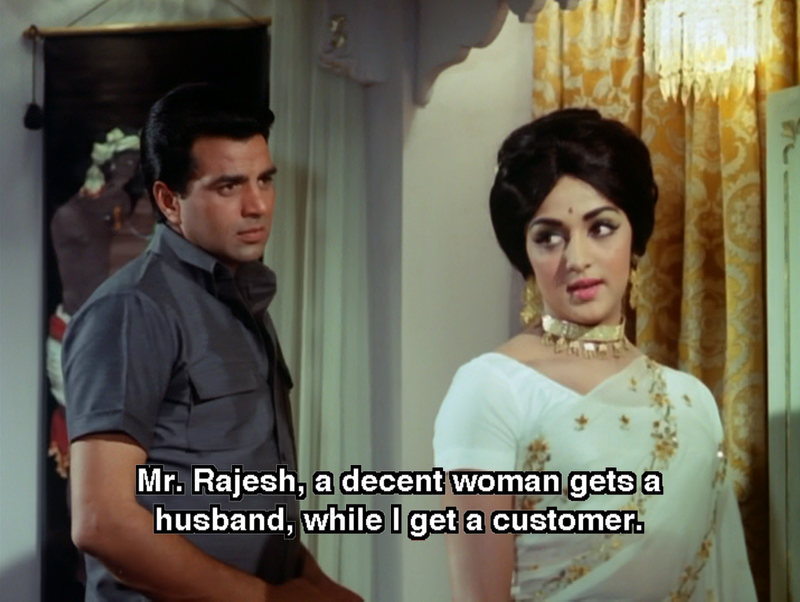 Sometimes masala is like that. 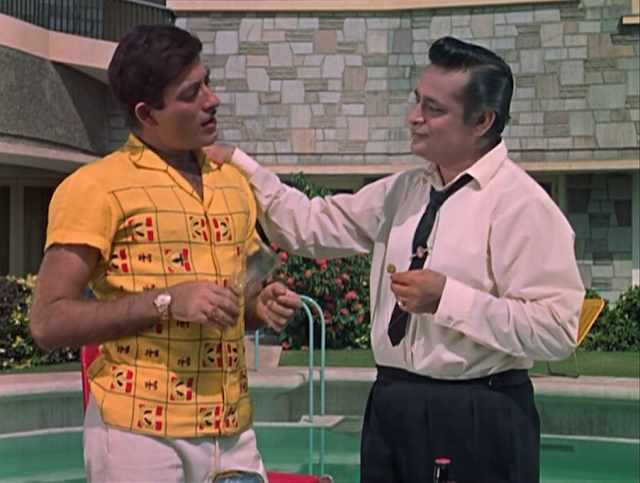 Plus, I can always just throw back a few cold ones and tune out all the happy-go-lucky courtship stuff and just enjoy Raaj's (he's the proto-Vinod character, so who else would I root for?) various turns as thief, scorned-lover, jealous criminal, sacrificing brother, and tearful bhaii-bhaii revelation-keeper. That's probably worth coming back for.